Lancia changed suspension design from the earlier IRS to a de Dion type for the rear suspension. It was implemented on the s.4 and later B20s, and all the B24s. The de Dion rear suspension used a tube to connect (and keep parallel) both rear wheels, giving more predictable handling than the earlier IRS. It was seen as an improvement for high speed drivers who were not as skilled as the earlier piloti of the Aurelia. The de Dion was quite popular at the time and was used in a number of high-end automobiles. Lancia continued to use it in all of the Flaminias, with the transaxle gearbox. It was also used on the D-series sports racers and Grand Prix car. Since that time, it has resurfaced in the past few decades to be found in Aston Martins and other high quality cars. 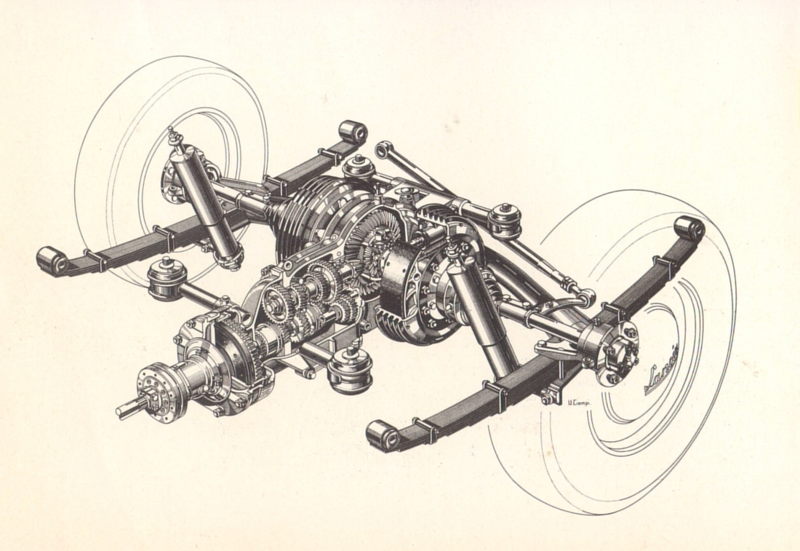 from the Owners manual of a late B20, an overview of the car chassis, showing the rear transaxle and the de Dion tube.